The WESA U18 boys soccer team had a rough start to their spring club season, dropping their first two games on Saturday, April 23 in Rifle, Colo.
It’s nothing new for the Crested Butte club team as they jump into a more competitive league during spring soccer in an effort to push their development. The good news is that their exposure to a higher level of play can only pay off in the long run. The bad news is it typically results in a long season where success is limited, at least in the win-loss columns. The Crested Butte team lined up for their first contest against Newcastle United determined to make the most of the conditions, as a steady wind blew across the field and, at times, in their faces for the entire first half. The Titans’ starting unit held on against the more skilled and experienced Newcastle team and the two teams remained scoreless through the first 20 minutes. Nevertheless, the constant pressure of the Newcastle squad eventually paid off as they netted two goals before the break to take a 2-0 lead into halftime. Disjointed play by Crested Butte continued to plague them in the second half as Newcastle dominated possession and utilized their core group of talented players to continue attacking Crested Butte straight down the middle of the field. Things then went from bad to worse as Newcastle stepped up the pace of play and found the back of the net three more times to finish off Crested Butte 5-0. After a brief break from the action, Crested Butte lined up again to face Rifle United. Rifle brought a similar game to the field, albeit a bit less intense, and Crested Butte started to get their feet beneath them to link a series of passes and find openings on the flanks. 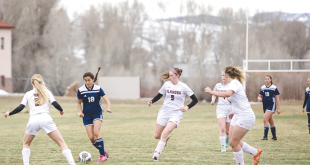 Crested Butte broke through Rifle’s defense on a couple of occasions to set up quality shots on goal but their attempts on net were either pushed aside or they missed their marks and the two teams were locked in a 0-0 tie at halftime. The turning point came in the opening 15 minutes of the second half as Rifle dominated 50/50 balls and continued to press down the middle of the field, forcing Crested Butte to collapse defensively. 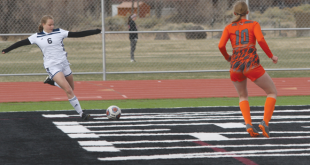 Again, the pressure ultimately gave way to a couple of goals as Rifle converted on a penalty kick and a direct kick to take down Crested Butte 2-0. The team will hit the road again this Saturday, April 30 to face Delta for another league match-up and continue play throughout May with home games scheduled for later in the season.